This week, Verité Research (VR) concludes its four-part series on Resolution 30/1. In 2015, Sri Lanka co-sponsored United Nations Human Rights Council (UNHRC) Resolution 30/1 and committed to a range of measures on human rights, accountability and reconciliation. Sri Lanka’s progress in fulfilling its commitments will be discussed today (March 20, 2019), at the 40th session of the UNHRC. 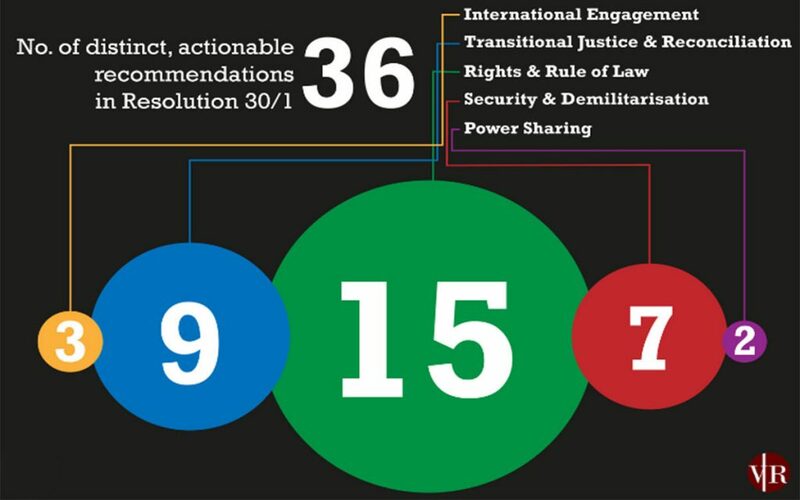 Resolution 30/1 contains 36 actionable commitments, which can be categorised under five themes; (i) transitional justice and reconciliation, (ii) rights and rule of law, (iii) security and demilitarisation, (iv) power sharing, and (v) international engagement (figure 1). Since 2016, Verité Research has annually assessed government progress in fulfilling these commitments. The assessment classifies each commitment into one of the following: completed, partial progress, poor progress, or no progress. This classification is based on an assessment of steps taken by the government towards implementation, and of government plans for implementation. VR’s latest analysis of progress indicates that, as at March 2019, the government has fulfilled 6 out of 36 commitments. Four years after co-sponsoring Resolution 30/1, the Sri Lankan government has fulfilled 6 out of its 36 commitments on reconciliation, human rights and transitional justice. Within a year of co-sponsoring Resolution 30/1, the government fulfilled the following commitments: (i) signing and ratifying the International Convention for the Protection of All Persons from Enforced Disappearance; (ii) maintaining engagement with the Office of the United Nations High Commissioner for Human Rights (OHCHR); and (iii) engaging with UN special procedure mandate holders. By January 2017, a government-appointed task force completed island-wide consultations on reconciliation mechanisms, moving one more commitment into the ‘completed’ category. In 2018, the government fulfilled two more commitments: criminalising enforced disappearance, and establishing an Office on Missing Persons. The Office on Missing Persons (OMP) Act was passed in August 2016, and the OMP became operational two years later. 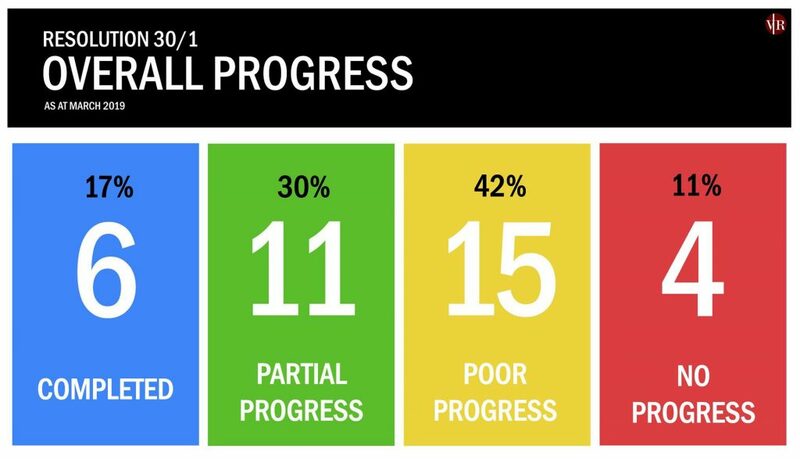 As at March 2019, 30% of commitments (11 out of 36) remain at ‘partial progress’. One such commitment is to establish an Office for Reparations. The government enacted a law establishing an Office for Reparations in October 2018; however, the Office is yet to become operational. Seven commitments that have made ‘partial progress’ relate to rights and the rule of law. These include: the release of previous presidential commission of inquiry reports; the review, repeal and replacement of the Prevention of Terrorism Act (PTA); and the granting of certificates of absence to relatives of missing persons. The Counter-Terrorism Bill slated to replace the PTA is currently under further deliberations in Parliament following a Supreme Court ruling that certain clauses in the Bill were inconsistent with the Constitution. Meanwhile, by April 2018, the Registrar General’s Department had issued 616 certificates out of 827 applications for certificates of absence. The government has made partial progress on some commitments relating to security and demilitarisation. For instance, there have been periodic releases of military-held land to civilian owners over the past four years. However, by the end of 2018, 30,187 acres of land (25,946 acres of state land and 4,241 acres of private land) were still held by the military. Approximately 42% of commitments (15 out of 36) have only made ‘poor progress’. There have been limited developments in establishing a commission for truth, justice, reconciliation and non-recurrence; in strengthening the victim and witness protection law; in ending military involvement in civilian affairs, and in introducing security sector reforms. Ongoing military involvement in civilian activity continues to obstruct the restoration of livelihoods and normalcy in the Northern and Eastern provinces. There has also been poor progress in holding perpetrators to account for attacks on journalists, human rights defenders, religious minorities and civil society. Some of these cases have been subject to interference from the security and political establishment, thus impeding progress. For instance, the military is reported to have withheld key evidence relating to the 2010 disappearance of cartoonist Prageeth Ekneligoda. The government lost ground in fulfilling certain commitments over the past four years. For instance, the prevention of attacks against religious minorities fell to ‘poor progress’ in 2017, with resurgence in anti-Muslim violence in Gintota, Galle, in November that year. There were fresh outbreaks of violence thereafter in the Ampara and Kandy districts in early 2018. Progress in ensuring the functioning of the provincial councils (PCs) also lapsed to ‘poor progress’ due to delays in holding PC elections. There has been ‘no progress’ in fulfilling four commitments. Resolution 30/1 includes a commitment to establish a judicial mechanism, with a special counsel and international participation, to investigate violations of human rights and international humanitarian law. However, over the past four years the government has maintained that it will not include the participation of foreign judges in the proposed judicial mechanism. There have been no legislative reform efforts aimed at establishing a judicial mechanism, and no publicly available information to suggest a government plan to that effect. As a result, the fulfilment of the three related commitments remain at ‘no progress’. The fourth commitment that has made ‘no progress’ is the review of the Public Security Ordinance (PSO). As at March 2019, the government has made ‘poor progress’ in fulfilling a majority of the commitments on human rights, accountability and reconciliation contained in Resolution 30/1. Most commitments saw no change in implementation status over the past year, and four commitments have remained at ‘no progress’ since 2018. 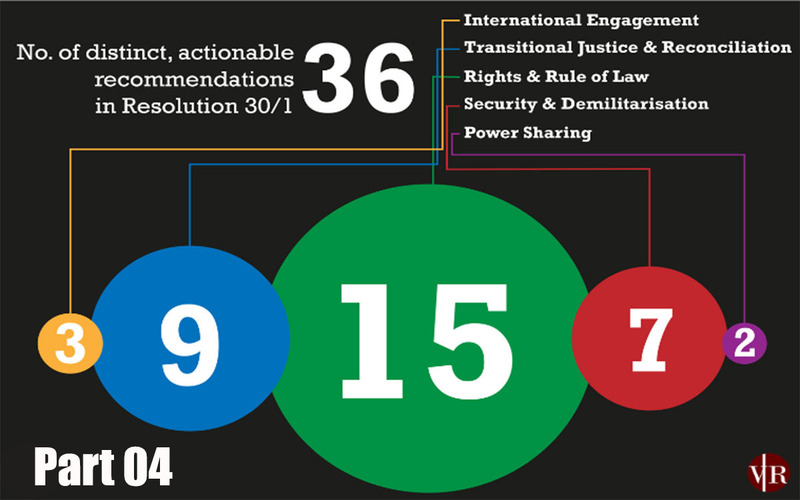 Four years after co-sponsoring Resolution 30/1, the government has fulfilled 6 out of 36 commitments.